French sculptor Louis Vidal was blind since youth, but he produced startlingly faithful renderings of animals: a bull, a wounded stag, a horse, a cow, a dog. With domestic creatures he could do this by feeling their anatomy directly, or by referring to skeletons or to stuffed specimens. But how did he create The Roaring Lion, the masterpiece first shown at the Salon in 1868? 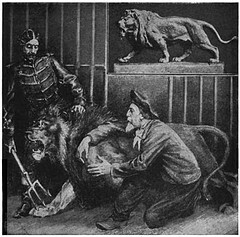 Legend has it that he did it the hard way: by running his hands over a live lion at the Jardin des Plantes. If that’s just a story … then how did he manage it? Opinions are much divided concerning the merits of the Pastoral symphony of Beethoven, though very few venture to deny that it is much too long. [Beethoven’s Seventh Symphony] is a composition in which the author has indulged a great deal of disagreeable eccentricity. Often as we now have heard it performed, we cannot yet discover any design in it, neither can we trace any connexion in its parts. Altogether it seems to have been intended as a kind of enigma — we had almost said a hoax. [Beethoven’s Eighth Symphony] depends wholly on its last movement for what applause it obtains; the rest is eccentric without being amusing, and laborious without effect. We now find [the length of Beethoven’s Ninth Symphony] to be precisely one hour and five minutes; a fearful period indeed, which puts the muscles and lungs of the band, and the patience of the audience to a severe trial. 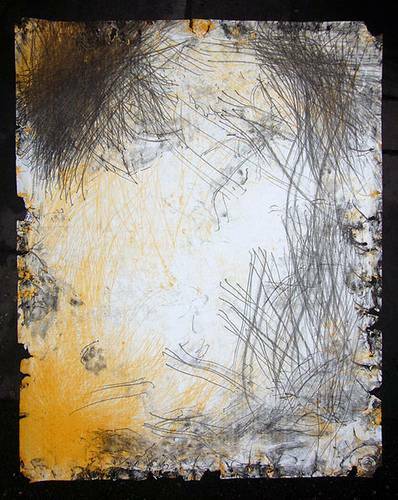 Here’s some pretty abstract expressionism — it was painted by a dog. Tillamook Cheddar is a Jack Russell terrier who works with her claws and teeth, spending hours on each canvas and biting anyone who interferes. She knows what she’s doing — to date she’s had 16 exhibitions in the United States, Bermuda, the Netherlands, and Belgium, and earned $100,000. We met Erhard Schön’s anamorphic woodcuts back in 2006. 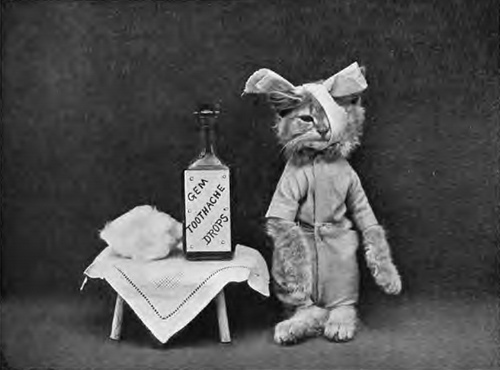 Harry Whittier Frees did a booming business in novelty postcards in the early 20th century, posing animals in human situations, including props and sets. 1816 is known as “the year without a summer” — the eruption of Indonesia’s Mount Tambora flung huge amounts of volcanic dust into the atmosphere, dropping temperatures worldwide and giving the sky a sallow cast that’s visible in Turner’s landscapes of the period (above). 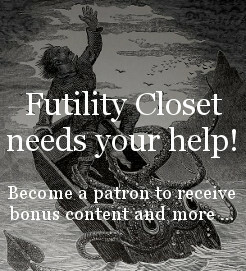 It was a great calamity for farmers, but a boon for horror literature — the “wet, ungenial summer” forced Mary Shelley and John Polidori indoors on their Swiss holiday, where they wrote both Frankenstein and The Vampyre. 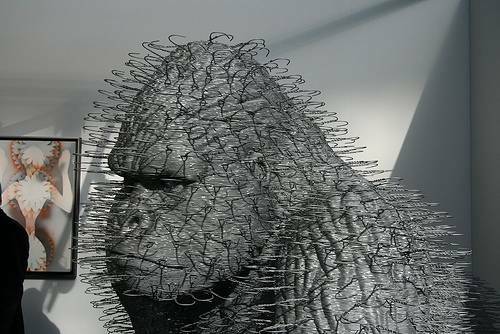 A gorilla made of coat hangers. David Mach’s 2007 sculpture Silver Back won him a place in the Guinness Book of Records for “largest coat hanger installation”; it’s not clear how much competition he had. The whole piece is 7 feet tall, 9 feet long, and 5 feet wide, and it required 2,705 hours and 7,500 hangers to make. 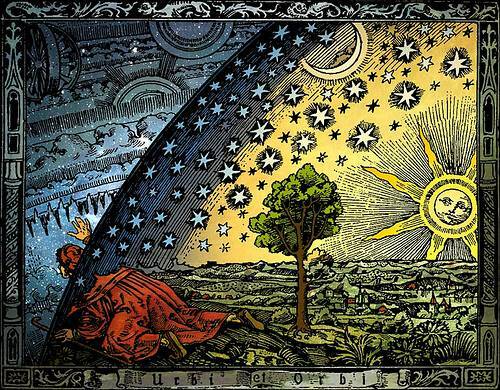 This is the Flammarion woodcut, so named because it first appeared in Camille Flammarion’s 1888 book L’Atmosphère. 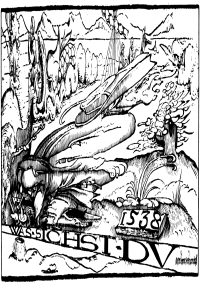 No one knows who created it; it’s thought to depict a medieval pilgrim who discovers the point where earth and sky meet. Flammarion’s book itself seemed touched by magic. As the astronomer was completing a chapter on the force of the wind, a sudden gale blew the last few pages out the window and off in a whirlwind among the trees. Then a downpour started, and Flammarion gave them up as lost. He was astonished, then, a few days later when his printer delivered the full chapter, with no pages missing. It seems the porter who normally brought Flammarion’s proof sheets had been returning to his office when he noticed the sodden manuscript leaves on the ground. He assumed that he himself had dropped them and so had collected them and carried them to the printer without telling anyone.